We have a presentation that is 80 minutes in length. The presentation is broken up into two sections, each about 40 minutes in length. This contest is to create both sections, totaling about 60 to 80 minutes in length. 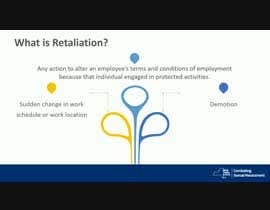 We need this presentation created in the provided Animated PowerPoint, and it needs to be much better, visually, than what is currently on the two pptx slide sets. •	Each slide has audio that needs to be matched together. •	Each slide has the PowerPoint text on the top, and the audio text on the bottom. •	We need the information to ‘animate’ (fade in, slide in, etc) onto the page, as the information is read in the audio file. Timing is very important. •	You must use the provided animated PowerPoint template. •	This PowerPoint presentation will be saved as a video file through the PowerPoint ‘Save to video’ setting. Make sure that your work can be saved as a M4p video file. You will provide the completed PowerPoint presentation and the M4p videos for each of the two sections. 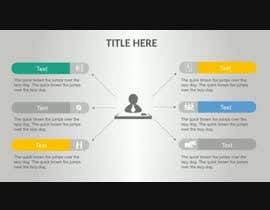 The animated PowerPoint template: hr_slide_designs must be used for this project. You have 14 days to complete the entire project, which is approximately 60 to 80 minutes in length. Compliance Publishing has completed over 125 projects on Freelancer. Hello, I just upload my entry, please review submission #31 . your feedback is very much appreciated. if it requires some changes or improvement please let me know. Greetings submitted entry 30..hope to get feedback from you thanks. Please wait for my entry, I am interested to propose best of my skill set for this project. please give me one chance. i give you a perfect work of power point , video with sound. Hi. 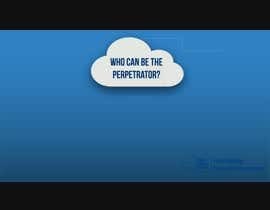 I can give you the presentation video made in power point with proper narration included. Please wait for my entry. Okay sure, will be sending in my work very shortly. There is some other point also 1. pdf note says- Page4 take 21:43 but when I play this time on slide 4 the voice is not according to content. Also when voice should end on slide 4 is not written. Slides 16 to 22 is about how anybody can edit this presentation, I don't know why you have given these slides. Please clarify and check the ppt you have provided. Please use the Section 1 and Section 2 PowerPoints that were uploaded yesterday as your guide. The transcript in in the PowerPoint files: Section 1 and Section 2, on the bottom of each slide. Hi, it seems like there is a missing file in this project? or you attached the wrong PPT file? 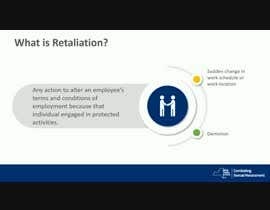 I had experience working with Compliance project and I think the PPT should have the content that we should animate with the exact timing as in the audio? I have uploaded two additional files yesterday that were missing from the original project. That should give you what you needed. As far as I am concerned, I am very confused. you are saying I have to use the attached powerpoint to work but in slide 3 says-" All icons on slides 1-13 can be replaced with images of your own." You must use the provided PowerPoint template. If you have an additional image that makes sense for the project, you may also use that. Hi. I have read all the instructions and am ready to start doing this project, but I do not know when this contest started and you are talking about 16 days. Can I make it as a video (not powerpoint)?